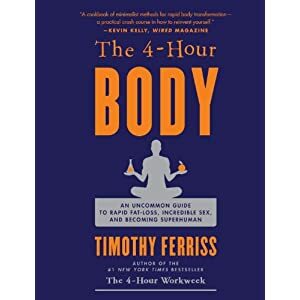 I picked up a copy of 4-Hour Body by Tim Ferris as soon as it came out and have been on his recommended diet and exercise program for about 1.5 weeks. One of the notable things about this book's diet is that it's not necessarily prescriptive in the diet, but more general. For someone like me, I actually enjoy being able to figure it out with the 50,000-foot guidelines, but I've learned a lot of things in the past week-and-a-half that, at the behest of some folks that are also trying to do the diet, I'm going to share here. Note that I don't pretend to be an authority on the diet from this book and I may, in fact, be suggesting things that are less potent, not exactly in line with the guidelines, etc. -- everything that I suggest, however, seems to be working for me. And, as someone reminded me the other day with regard to the diet: "You have to be able to live with it." Odorless garlic caplets are about 95% odorless, which means that you get a lovely taste of garlic every time you pop one in your mouth. I recommend odorless garlic gelcaps -- they don't have any dust or taste at all, and I assume they are just as effective. The Athletic Greens product does allow you to stop taking multi-vitamins, but they don't have any Omega-3, so you'll want to take a fish oil supplement -- I recommend the Norwegian Gold as you only need to take one and I've never had a burping/taste problem with it. If you can get past the texture of it, Athletic Greens really isn't that bad and you'll be taking enough pills as it is if you follow the AGG/PAGG stack, so it's kind of nice to replace multivitamins with the drink. Note that Athletic Greens is a powder that you mix into water, so you want to use as little water as possible to make it go down more quickly and a taller, skinnier glass makes it easier to mix without clumps. All of the AGG/PAGG components are available at GNC, but I had better luck finding them more consistently at VitaminWorld -- not sure if this is just an immediate effect from the book coming out or if GNC in Denver just doesn't keep high stock in some of the items. Also, GNC does not have the odorless garlic liqui-caps. I wasn't able to find the exact probiotic pills that are listed in the book anywhere but the website in the book, but VitaminWorld and Amazon do have several probiotic supplement options, including at least 1 product that combines probiotics and prebiotics in the same pill. If you elect to take Athletic Greens, you are getting prebiotics and probiotics, but I'm also putting a probiotic pill on top of that and counting the Athletic Greens only for its prebiotic as suggested in the book. The point here is that if the Athletic Greens don't appeal to you, there are pill supplements out there that will provide both prebiotic and probiotics at once. I like the bright color of the GNC brand Alpha Lipoic as it differentiates it from the garlic softgels that I'm using, which are exactly the same size. Get a pill organizer for all your pills to help keep you straight -- I've got the cheap $0.99 one that they sell at the register at GNC or VitaminWorld that has 5 compartments: 3 compartments with AGG, 1 with PAGG, and 1 with a probiotic and Omega-3 pill. You're not going to eat enough. I wasn't really a breakfast eater, so my first breakfast of 5 eggs, 1/2 can of beans and salsa felt like an extraordinary amount of food, but I choked it down. Essentially you know you're eating enough if you're full and don't get really hungry in between meals (assuming that your doing a typical 3-meal diet). Chipotle is your friend. It's easy and quick and generally tasty. I do the steak fajita bowl with no rice, extra black beans, pico, green salsa, guac, and lettuce; if I'm really hungry, I do extra steak. Use the various flavors of Tobasco they have to change the flavors if you eat it a lot. Guacamole is heard to remember to get enough of -- if you have it on your burrito bowl at lunch, you've only gotten 1/2 of what you should consume in a day. The stuff you can buy at Costco is sealed fresh without preservatives and freezes -- you can get it from frozen to edible in about 5 minutes using the defrost setting on a microwave. Costco has a lot of fresh salsa and pico de gallo choices, but only a few are sugar- and preservative-free -- make sure you read the labels before you buy a bucket of salsa from Costco. Canned organic beans at Sunflower Market are the same price as the non-organic ones at regular stores. Example: Sunflower Brand black, organic, refried can of beans = same price as a can of Rosarita refried beans at Safeway. Low carb isn't as hard as you think at restaurants, but it is hard to find legumes. Examples: Brewery Bar III offers their fajitas with lettuce cups instead of tortillas, Taste of Philly Cheesesteaks will do any of their sandwiches on romaine instead of bread. Sushi is expensive when you're not getting rolls -- this to me is more of a cheat day thing where I'd go and gooblesashimi works very well for the diet. Get creative with food places. Examples: Yuan Place Mongolian BBQ where you can fill up your own bowls for them to cook means that you can just fill it with protein and vegetables (go at night when it's all you can eat) and at cajun places ask for the red beans and rice without the rice. Most nice steak places can easily do steaks with sides of broccoli and cauliflower and may even have some appetizers that feature guacamole, but I've yet to find one that actually has any sort of legume as a side. Lentils (known as "dal" or "daal") are a staple of Indian food and can generally be found as an inexpensive side dish to put along some tandoor-prepared proteins -- India's Castle is always my go-to place. Sugar-free Jello, as Ferris points out, can be helpful for cravings, but that stuff is almost sickly sweet. If you don't want to keep it around in a big bowl in the fridge, you can buy the individual cups of it at the grocery store. Cook lentils at home and they'll last you for about a week if you use a whole bag. Organic green lentils taste better and get softer than what you might pull off the shelf at Safeway. Prep is simple: put some butter in a pan, saute some garlic in it, pour in a box of beef broth (don't use the low sodium), pour in some Italian seasoning, let it boil to combine flavors, turn it down to medium and boil the lentils. In CO it seems like you need to boil the lentils for over a hour and you'll likely need to add some additional water throughout the cooking process. Once they cool, put them in a sealable container. in the fridge and heat them up as you need them in the microwave. Go buy some disposable tupperware/gladware -- good for leftovers, bringing portions with you, etc. and you won't care if you lose it. Hardboil some eggs. Lots of diets recommend this and there's a reason: it's easy, portable protein. Do it. Take 16 organic eggs, cover them in a pot with cold water, turn the heat on high, and time 10 minutes from when the water starts to boil. After 10 minutes, remove from the water and cool. Take the time when you're cooking them to remove the shells so that when you grab them from the fridge, they are ready to eat. If you're cooking eggs: use eggwhites with your regular eggs. For example, I might fry 3 organic eggs, but I'll pour in 1/4 cup of egg whites -- it tastes better (and apparently doesn't smell as bad in the house). Costco sells 85/15 organic, grass-fed beef in 3lb packs -- get a pack, make 6 8oz burgers and leave them in the fridge. You'll eat them in a week. Costco sells bison in 2 1lb packages -- get some, it's good. Some places sell ground lamb meat -- different tasting burgers, good to mix with beef, or try this: saute some onions and garlic in some butter and brown the lamb meat in it, add in cooked lentils at the end just to bring them to temperature, and serve over steamed or baked cauliflower. Lentils produce less gassy effects than beans. That's just how it works. I don't know why, but I eat more lentils when I can. On your cheat days, you're not wasting calories, you're wasting fullness. In other words, if you would be happier having 2 Big Macs and fries for lunch as opposed to some custom sandwich that costs a lot more, may not be as satisfying, and reminds you a lot of what you're already eating on the diet, then have the Big Macs. Watch out for hidden sugars in sauces. This is especially true in Chinese restaurants where healthy-seeming things are not really diet friendly. Hints: black-bean sauce does not mean legumes and beef with broccoli generally has a ton of sugar in it. Truvia isn't very prevalent yet -- if you need to add sweetener to things, get a box of it at Costco and carry the packets with you. Mexican food stores and carnecerias are generally the best places to find the cheapest avocados; if you're not comfortable with that, buy the big bag of them at Costco and let them ripen in your house. Take advantage of the fact that you can have a glass or 2 of red wine. Try out Chilean and Argentinean red wines -- generally there are some pretty good offerings at lower prices. Eat out at places where it's not obvious that you're on a diet. Case-in-point: went to a place where I thought I had slyly ordered a burger without a bun and a side of refried beans and when the plate came, let's just say that there was a lot of white space on it, which made the person sitting with me uncomfortable/embarrassed by what he had ordered because it looked so massive in comparison (note that if I go to that place again, I'll be ordering the double burger without the bun to (1) fill up the plate, and (2) get enough protein). Don't weight yourself. Your weight bounces around all over the place, especially after cheat days. Take pictures, use measurements, whatever, but don't count on the scale to give you the true story. The most telling thing for me is how loose my pants are getting at the waist. Use something to keep track of what your eating and stacking. I never used to do this, but I'm using PBworks to do this and it's shared with my wife, so she can update her participation as well. You don't have to be all high-tech, but writing it down makes a difference and creates accountability. If you're going to drink the yerba mate tea, I recommend the chai spice flavor. If you think Starbucks coffee tastes burned (like I do), then get an Americano (that's what the barista told me) -- as long as you don't dump sugar and cream and stuff into it, the Americano works the same way as coffee. Apparently an Americano is a shot of espresso with water added to it, so the upside is that you can add to the caffeine by adding extra shots, which you can't do with the standard brew. Drink lots of water -- I like using 1 liter bottles of SmartWater as my bottled water, and it has potassium in it, which you may find yourself deficient of on this diet, so it's not a bad source for a little extra and Costco frequently has the cases on sale. If you add lemon to you water it makes you pee a lot more and both this book and others that I have read suggest adding some citrus, especially on your cheat day. There are some pretty lively discussions about different 4-Hour Body diet points over on the official website about the book and I encourage you to visit it to get more information, ask questions, etc. I also recommend checking out HumanPerformance.net for some interesting information about Athletic Greens and general health. Thanks for the info. I am on the start of my second week. I am wondering how this diet will work in the long run?? Any thoughts? I think how the diet works in the long-run depends on you: do you see it simply as a termed diet or a lifestlye change? Frankly I look at it as a lifestlye change -- now that I'm into week 3, it really isn't that big of a deal to follow the diet and I've committed to following it to the letter for at least a month; my guess is that after 4 weeks it will be even easier to continue to follow it. My measurements at the end of 2 weeks showed a loss of 2 Total Inches, which seems pretty good. I like the amount of information you've shared. I'm just now on my first "binge" day at the end of my first week, and I've found it reasonably easy to follow, though I may be doing a lot of things wrong (the take on dairy seems very ambiguous, but I will have to reread to see if I may have misunderstood). Can you post a direct link to the "lively discussion" you were referring to? I'd be very grateful. This is definitely working for me so far. I've only been doing it for a week and I already lost significant weight. Same for my wife. We actually both felt really disgusted at how our bodies reacted to eating bad stuff again on the cheat day. We are using the really good recipes at www.4hourrecipes.com. Hi, Ross. Thanks for the great post. I've been doing the eating plan (I'm one of those who hates the word "diet") for three weeks now, and it's been going very well. I actually was Googling user experiences when I came across your blog and its excellent tips. Then I saw you mention Denver, which is great, because I live in downtown Denver! Thanks again for the blog. I'll keep checking it. Does sorbitol as a sweetner have any impact on the diet? I know he says Ferriss says no to Splenda and some other sweetners. Sugar free gum has sorbitol which I chew. I'm certainly no expert and wouldn't want to give you any advice on non-natural sweeteners. Perhaps think about posting a comment over on the 4 Hour Body Blog and see how folks respond. Extremely helpful. Thank you for this. Excellent blog - i really like this. thanks for sharing, i'm a bit puzzled in what i should be buying tomorrow at the supermarket (having never used lentils) so this was an interesting resource. I have been doing this for a month and only lost 5 pounds. Seems that the cheat days do not work for me. I lose 5, I gain 5, I lose 5 and so on. I've only been on the 4HB diet for one week. I've following the diet EXACTLY, including drinking two glasses of water with each meal. I've lost a total of 5.25 inches and six pounds. I gained three pounds after my cheat day, but am hoping (fingers crossed) that when I weigh myself this Saturday morning, I will have lost those three pounds in addition to some more weight. My goal is to lose 24 pounds in 60 days. Wish me luck! Hi , just started reading the book ,, can I do the diet without taking the PAGG stack ?? and will I still see significant fat loss ? He certainly says you can skip the supplements , but I have not tried it without them. just one more question ... I normally go to the gym or for a jog first thing in the morning (at least 3 days) before work , so wouldn't be able to eat until about 3 hours after waking , and really don't fancy eating before hand or not going .. any thoughts ? seriously tho? fabutastic stuff here and i really appreciate the detail you provided. i'm on day 4 and i'm participating in the couple's competition over at fourhourbodycouple.com anything i can use to fuel my competitive edge? bring. it. on. I carry always a lot of extra fat in my hips and thighs. I thought this would be a great thing to try. I started at 115, by the end of the week was 118, had fat day and now 5 days later 120. I have been doing this for two weeks. I have been sticking to the diet, I drink a minimum of eight cups of water and now Im stuck. I don't always eat the avacoda as I should. I have started pagg and I take Omega-3 every night. Really helpful post, thank you. I've just downloaded the Kindle version of the book and am going to start the eating plan. Your post makes me more confident about fitting it into my lifestyle. Not sure why I didn't post a comment earlier, but I found your blog while I was just starting the 4 hour body slow carb diet. This guide really helped me, especially the bit about lentils over beans and the idea of keeping track of what I am eating. For that I use the iPhone app "lose it!" it was free at the time, probably still is. Anyway, had to come back and say thanks for writing this, helped a bunch - I'm down about 13 pounds and counting! Thanks for the info, I'm curious as whether this type of diet could become a long term habit. Great blog thanks. In reference to Debbies comment on trying to fit in food pre exercising in the morning. I have found two options ..1. a protein shake (Pure Protein, vanilla ) which is nice tasting or a tablespoon of almond butter with a touch of honey. Exercise takes on a new meaning with this bit of sustenance. This looks really promising and I intend to start with it tomorrow. Hopefully I would get the same result as most of the people here. I have tried a lot of dieting techniques but they all left me with lesser energy to last me the whole day. I hope this one won't be the same. i'm not believing in i'm going to loss weight into 2 weeks. that's not possible i think. but i will try it. I am coming to the end of my 3rd week and have been 100%. I have only lost 1lb per week. What is wrong???? After trying everything (and I mean everything) I am excited that I have found something that I can stay with. I feel wonderful, very alert and energetic. The cheat day is a nice prize at the end of the week. 6 weeks now and 12 lb down. Slow and steady wins the race! Just started week 2. I am down 3 after a fantastic day of cheating. Homemade oatmeal cookies, Mexican for lunch, & bourbon and blueberry pie. I have found in my weak moments, like when my wife came home with a special treat for our son of fried chicken & French fries, I can chew it and then spit it out. Now I do this in the kitchen away from everyone so it doesn't gross anyone out. Is this a poor man's version of what bulemics do and is it ok dietwise? I dont believe in these types of weight loss schemes. What ever happened to good old fashion hard work? Diet and exercise is still the best to lose weight and keep it off you know. I think 1.5 weeks is not enough to get the ideal body. I think a good diet is a diet that has the ideal outcome in the long run. I think that regular diet should be balanced with regular exercise, so it can produce ideal weight. Usually the diet affected the lifestyle changes, such as food and beverages we consume. Is organic food can be part of a diet program? I think organic food is just not enough to do this program. You mention the Guacamole is very good for dieting. What is the function of Guacamole? I am on day 3 of the diet and I don't know if I'm eating enough. PLEASE HELP! For breakfast I have 1 - 2 eggs with a bottle of water. For lunch I have been eating chicken with broccoli, green beans and peas and I have the same thing for dinner. I'm not a big eater and I dont have much to loose but if I'm eating like this will I lose some weight?? Dear Friend, I had this problem with my weight since I love eating several foods in my ref. and made me as huge as a cow. I would love to know if this tips you have posted will be as effective to various individuals of different body structures? That's was a long list of facts about diet right there, you do have a vast knowledge on this certain matter. Thanks for sharing.. This is helpful diet tips & tricks. Great Post! More information. 4 - hour body. Been on the diet for 8 months, down 30 pounds. The last six weeks have been difficult. Fighting off 5 of the 30 pounds I lost every week, but not losing anymore. It seem the diet has completely stopped working and I'm not cheating. Disappointed as I still have another 15 pounds to go and I'm getting nowhere. Anyone have suggestions?